Home / canon / comics / corporations / fandom / korrasami / sesame street / But Is It Canon? As we have always said, Bert and Ernie are best friends. They were created to teach preschoolers that people can be good friends with those who are very different from themselves. Even though they are identified as male characters and possess many human traits and characteristics (as most Sesame StreetMuppets do), they remain puppets and do not have a sexual orientation. So, if anything, Bert and Ernie (and pretty much every "adult" Muppet on Sesame Street, absent specific evidence otherwise) are canonically ace. 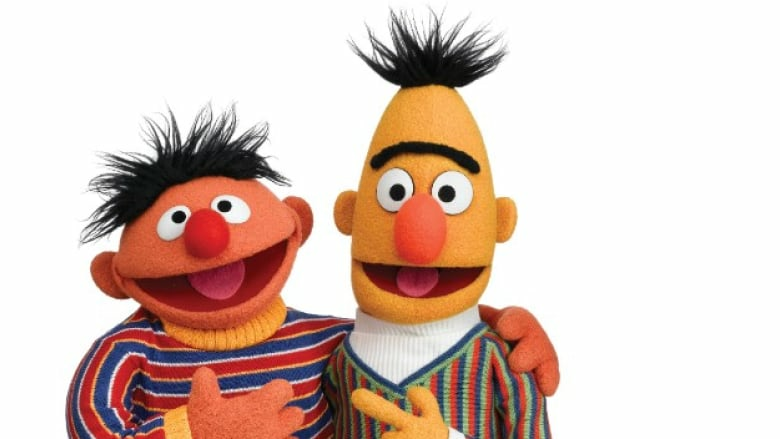 I leave for another post (not necessarily by me) to debate the matter of what constitutes an adult Muppet in the Sesame Street setting, but since Bert and Ernie live together with no parental supervision, I expect they count. This all got whipped up because someone who wrote for the show for several years said he modeled their relationship on his own relationship with his boyfriend. Frank Oz, co-creator of the characters, has said on many occasions (including reiteration this month) that the two are based on him and Jim Henson, with no romantic relationship intended or implied. So, are they canonically gay because one of their writers said so? Of course not. Work-for-hire writers don't get the last word on the canon. Are they canonically not gay because Frank Oz says they're not? Not really, because Oz does not own the characters, although his position is at least consistent with the position of Sesame Workshop. They're certainly not canonically gay just because adult fans want it to be so...representation is important, but fans don't get to decide the canon. In a world of entertainment that is owned by corporations rather than by the creators, there's some confusion among fans regarding what is considered "canon." This essay will address some of the layers and complications, then provide another example in which something eventually grew from "crazy fan opinion" to confirmed canon. First, let me define some terms, because a lot of fannish vocabulary is notoriously slippery, plus there's things I want to talk about that really don't have an accepted term but which are awkward to describe fully every time. Not everyone will agree with my definitions, but I don't want to have to restate all the caveats every time, so here they are in one bit. for Lo it is super-creepy." Canon - This is something that appears unambiguously in the official media, or a in a statement from the owner of the property. An owner may not have an interest in establishing a canon or officially dealing with any contradictions within their stories, but they're the only ones who can. A canon can only be enforced by someone or some organization with a recognized authority to do so, and the owner of an intellectual property is that someone under relevant IP laws. Subtext - Okay, this is an actual regular term, but I'm dropping it here to point out that the owners may permit a large amount of subtext while officially denying that the conclusions drawn from the subtext are true. Subtext can also be sneaked into a work without authorization, such as an actor taking it upon themself to behave as if their character is in a secret relationship with another character. Headcanon - This is something that is only considered true within the head of a particular fan (or maybe a small group of fans), a "canon in my head". It may be a reasonable interpretation of the known canon and the subtext, or it may be totally insane, but it has no level of official support...yet. Fanon - Often used interchangeably with headcanon, I tend to see it applied more in situations where a lot of fans share a particular view. It's a view of the fandom as a whole, or at least a significant chunk of it. For instance, the view that Orion Pax's friend Dion from the Transformers episode "War Dawn" got rebuilt as Ironhide is a piece of fanon that grew out of someone's headcanon. Owner - Whoever legally owns the property. Sometimes it's the creator, but in mass media odds are pretty low for that. Usually one of the handful of media conglomerates has ultimate ownership, but delegates control over the canon to the most directly involved subsidiary. Creator(s) - The person or people who actually came up with the original idea. Siegel and Shuster are the creators of Superman, Frank Oz and Jim Henson are the creators of Bert and Ernie, etc. Sometimes the creator is the last person the fandom wants controlling the canon, if they feel that the creator has lost their vision (Gene Roddenberry, George Lucas, and so forth). Creatives - I want to lump together all the people who work on the property other than the creators, without saying "writers, actors, artists, and so forth" every time. So, when I say creatives, that's what I mean. Creatives all have hands in developing the property, and frequently add subtext with or without the permission of those above them in the chain of command. Word of God - A term sometimes used by fandom to refer to a statement made by the creator of a property, generally in an interview, on a panel discussion, or over social media. Such statements provide context for subtext, and often reveal background that never made it into the canon for whatever reason. There is a definite trend in fandom to elevate the creator over the owner, in terms of respecting opinions, although they're just as likely to side with whoever supports their headcanon regardless of source (i.e. if the Word of God conflicts with headcanon, but one of the creatives agrees with it, the creative gets precedence over the creator). Shipping - Imagining relationships not yet shown in the official media, this is a common topic of both headcanon and fanon, with a particular case of it being called simply a ship. (Pedantic aside: shipping was once used to refer specifically to heterosexual relationships, with slash for homosexual, and femmeslash for specifically lesbian couples. But usage has broadened, and shipping now usually covers all possible relationship-based fanon.) Individuals may fiercely defend their OTPs (One True Pairings) as headcanon, but certain ships catch on and are considered "something the writers would have already done if they weren't stupid-heads" (or the like). Okay, that's all the terms out of the way. The spectrum that runs from "crack ship headcanon" to canon is full of shades of gray, but here's an attempt at establishing some waypoints. An idea can enter this spectrum at any point, and can be moved up and down it in response to all sorts of events, including Word of God and interviews by creatives. 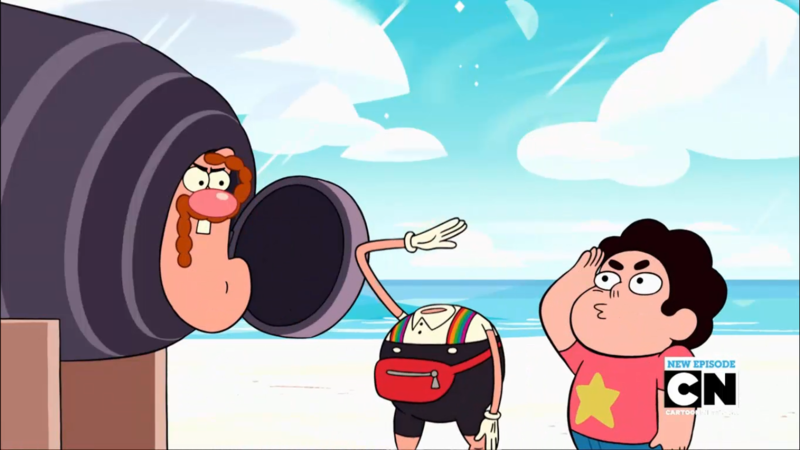 Wrong - This is where sunk ships, incorrect mystery-solving guesses, and refuted headcanons end up. It's basically anti-canonical, something that has been definitively ruled out by the canon. Headcanon - Some people have picked up on what they consider to be clues, and until convinced otherwise will believe it to be true. Fanon - Critical mass has been achieved, it's no longer a particular person's headcanon, but considered a viable theory by a lot of people. Pseudo-Canon - Sometimes the owners don't really seem to care about maintaining a canon, and in the absence of their statements, lower authorities (creators and creatives, or even well-regarded fans) are heeded in establishing a pseudo-canon. Technically these are just validated fanons, but if left along long enough there's a sort of tacit assumption that the owners are cool with it, even if they can't be bothered to say anything about it. Kidvid properties are rife with holes for pseudo-canon to plug. For instance, in the original Transformers cartoon, Megatron built the Constructicons on Earth, but the Constructicons built Megatron on Cybertron millions of years ago, but Megatron corrupted the Constructicons who used to be Autobots. Technically, those are all canon, but they don't fit together well, encouraging headcanons and fanons to explain it. The Word of God didn't help disentangle it, merely admitting things like, "We were under a lot of time pressure and often stuff slipped though, oops." In this example, a fanon that hardened into pseudo-canon explained the "Megatron built the Constructicons on Earth" part by saying that Megatron was being sloppy in phrasing, and that he meant he'd merely built new bodies for the personality components. Another pseudo-canon claims that Megatron built the Constructicons before turning evil himself, so he later corrupted his creations to bring them into the fold. To the best of my knowledge, Hasbro never actually officially cleared any of this up, just moved on and rebooted. When the topic is controversial, though, owners rarely let pseudo-canon stand if it might damage the brand, unless the ownership is actually such a mess that no one can fix anything. When something is merely fanon, they can ignore it, but once creatives start validating it? That's why Sesame Workshop finally issued an official statement on the nature of Muppet asexuality in Sesame Street after decades of quietly letting people ship Bert and Ernie (which, by the way, is kinda creepy...they may be adults in the sense of being legal tenants of an apartment, but they still code as kids). In the absence of an official denial, the writer's statement would quickly solidify into pseudo-canonical lore, and they didn't want that to happen. Deuterocanonical - A special type of pseudo-canon happens when the owner allows for "side universes" that are still official, but aren't the main canon. 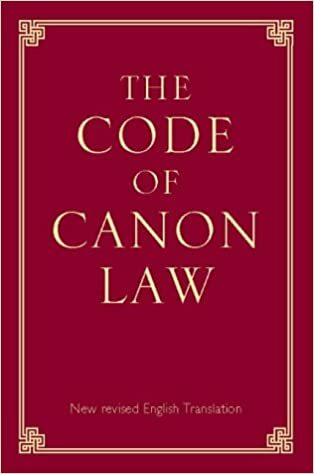 In Biblical scholarship, "deuterocanonical" (secondary canon) works are accepted by the Catholic Church but not by the Protestant faiths, to distinguish from "apocryphal" works that have dropped to the effective level of Bible fanon. I like the idea of using the term to describe when the owners allow for multiple streams of canon, in which one is the favored set and the others are somehow less canonical. For instance, comicbook tie-ins for movies or TV shows are often official, but don't fit into the main continuity for whatever reason. (Even some direct adaptations fail to fit, because they were based on shooting scripts and don't reflect later editing.) Ongoing comics not directly adapting existing stories are deuterocanonical, expected to follow the lead of the movies or TV show while not allowed to really influence the main property. The Marvel Star Wars comics of the 1970s rapidly went off the rails, telling stories that really couldn't fit in with Empire Strikes Back, but that were still official, sort of. The My Little Pony comics frequently find themselves contradicted by later episodes...still official, but respecting canon only goes one way, characters introduced in the comics generally do not appear in the show. Sometimes it seems like Transformers is several dozen deuterocanons in search of a canon. Retcons often result in works being demoted to deuterocanonical status rather than dumped in the Wrong bin. When DC first declared that Superman had never been Superboy, this spun the Legion of Super-Heroes off into a weird secondary deuterocanon where all the Silver Age stuff still sort of happened, but the LSH could still visit the post-Crisis present day. Multiverses in general allow old stories to still "exist" somewhere, just not in the main canon. Canon - Most canon starts off as canon, being the stuff that's in the official media. Taking ideas from fans can be legally squirrelly, so owners can be reluctant to canonize anyone's fanon. But sometimes fanon merely anticipates as-yet-unrevealed canon, when people guess correctly or read the clues properly. Any time there's a mystery in the property, there will be loads of fan guessing, and some of them have to be right, yes? And even shipping can just turn out to be a case of the fans correctly seeing which way the writers were going with things. Once in a while, though, the owners will actually respond to fan clamor and (once they run it past a lot of lawyers) make it official. For instance, fans of My Little Pony: Friendship is Magic noticed that a background pony in the first season kind of looked like David Tennant as a pony, and he kept showing up multiple times in a single scene (first season had a lot of cloning of backgrounders), so they named him Doctor Hooves (or Doctor Whooves). Eventually, "Doctor Hooves" became the character's official name and he got toys and an episode to star in (the same episode as the SUCH GOOD FRIENDS scene shown above). Another fanon name for a season 1 background pony, "Colgate" (after the toothpaste-like look of her mane), did not make it past legal review, for obvious reasons. And now for an example how something can progress through most of the stages, the "Korrasami" relationship in Avatar: the Legend of Korra (A:LK). As soon as Korra and Asami existed in A:LK, I'm positive some fans were already envisioning them in a romantic relationship. It's one of the rules of the internet, basically...not quite Rule 34, but adjacent to it. If characters exist, someone is shipping them. If it makes no sense at all, it's a "crack pairing," but they'll still be out there in someone's fanfic or Tumblr posts. During the final season, though, this went past Obligatory Shipping and fans found numerous bits of subtext, parallel scene layout, and so forth, that strongly suggested there was actually a relationship there. It was no longer an isolated headcanon, an OTP ship, it was a widely accepted fanon. The transition to validated fanon came when the show's creator outright said that yes, they were intended to be a couple, but for various reasons involving fear of losing access to first broadcast markets in some countries, Nickelodeon refused to confirm it in the show itself. So, at this point the subtext had been confirmed, all the clever analyses were proven right, and many people were shouting "CANON CANON CANON!" on social media. But Korrasami wasn't canon, not yet. No amount of Word of God confirmation matters if the creator is not the owner of the property. As far as Nickelodeon was concerned, the two were Such Good Friends, and if you wanted to read more into that, you could, but it wasn't official even if the series creator said it was really more than that. and didn't throw away their shot. 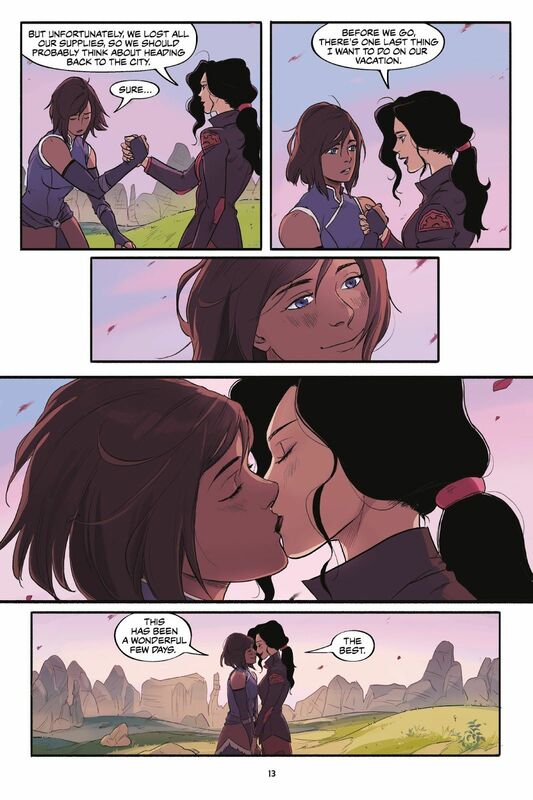 Finally, after the series had been completed and earned most of the money it was going to, Nickelodeon okayed the Turf Wars comics (which, in reference to my previous essay, were released as non-floppy installments sold mostly to bookstores and on Amazon, rather than through the Direct Market) which made it abundantly clear that Korrasami was a real thing. (And yeah, Mako got to deal with that, it was awkward as hell for him.) With the opening scene of Turf Wars #1, the relationship finally got upgraded to canon. If there's ever another Avatar sequel series following a generation or so after A:LK, would it ever mention the relationship on-screen? Maybe. A lot would depend on the distribution model...if they stick with Netflix, currently developing a live action Last Airbender series, they'd have the freedom to keep Korrasami as solid canon. But if they go back to the on-air model that forced them to stay coy about it during A:LK, Korrasami might even regress to being pseudo-canon, either explicitly denied (making the Turf War comics explicitly deuterocanonical) or just never talked about directly. Dvandom, aka Dave Van Domelen, is an Assistant Professor of Physical Science at Amarillo College, maintainer of one of the two longest-running Transformers fansites in existence (neither he nor Ben Yee is entirely sure who was first), long time online reviewer of comics, has no ship in this regatta, is an occasional science advisor in fiction, and part of the development team for the upcoming City of Titans MMO.